So this is my first time trying to really fine tuning a load, I'm a beginner with reloading. I just built a 264 win mag and trying to work up a load for 140gr berger Vld and I'm using h4831sc.....I did a ladder test and 61 gr seemed to be my sweet spot so I just did the seating depth test that Berger says on their website and this was the result. I thought I would get one group that would really stand out from the other 3, but 3 of them are fairly similar.....3.387 is touching the lands if any of you are wondering. Should I have waited on the ladder test and did this test first? 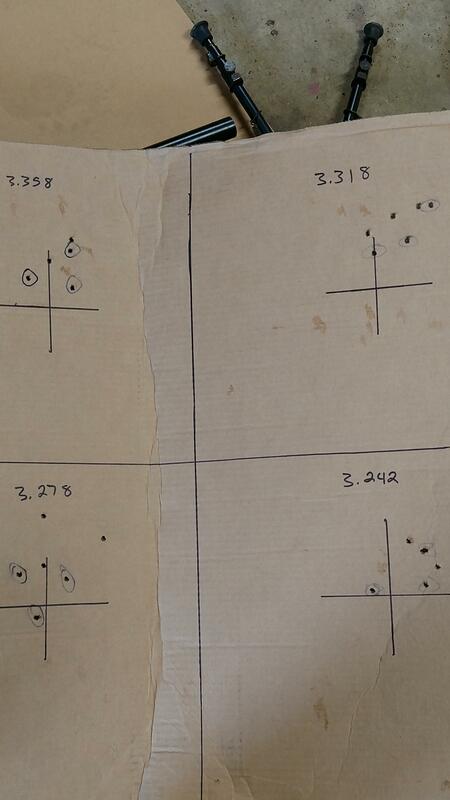 If so I should probably go back down to the 59.5 gr and do this test over? I'm not a huge fan of the ladder test, there are a bunch of variables introduced that make it tough to be sure the results are accurate. Do you have access to an accurate chrono? I would start there. It seems the days of shooting groups as the starting point are in the rear view mirror. With a good chrono, you have reliable data to base decisions on. In my experience with VLDs in several different rifles including the 264Win, they all shoot the best somewhere between touching and 0.030” off. 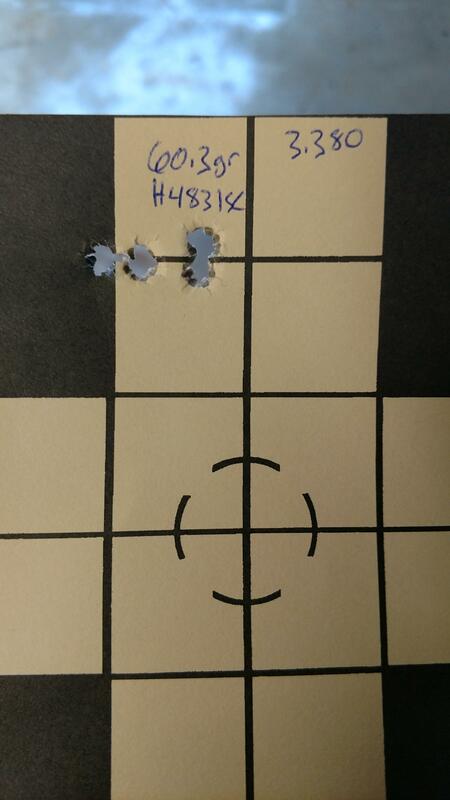 My 264WM likes 59.5 grains of H4831SC with the 140 hunting vld ten thou off. Make sure the barrel cools between shots and groups for testing. That 264 runs hot. If you were closer you could use my magneto speed. Bet some one here is near you that would be willing to help. When I’m starting load development I’ll start with a low charge. Load up some 3 shot groups starting at .015” off the landes or mag length which ever is shorter and seat each group deeper by .030”. Which ever shot best I’ll use that seating depth for my load work. I shoot a ladder over my chrono ( I use magneto speed, must have an accurate chrono for this!) target dosent matter. Look for my upper flat spot near max. Then I’ll load up 5 shot groups and fine tune my seating depth in .005” increments. If you don’t have a magneto speed or labradar then you could do 3 shot ladder test at 300 yards. I load mine .015 or so off the lands. Then shoot over a chrono into a dirt berm to identify flat spots in speed as powder charge increases. Once i identify 2-3 i load 3 to 5 at each node. Pray one of those shoot well. Then load 10 of those shoot over chrony for ES and SD. Do you have parallax adjustments on that scope? You mentioned 3.368 was touching and I see on your recent post it shows 3.380 so you're now jamming them 12 thou ? ?